Active Directory discovery rules allow you to discover computers being part of an AD domain. This method is recommended for client environments with Active Directory domains of any size. 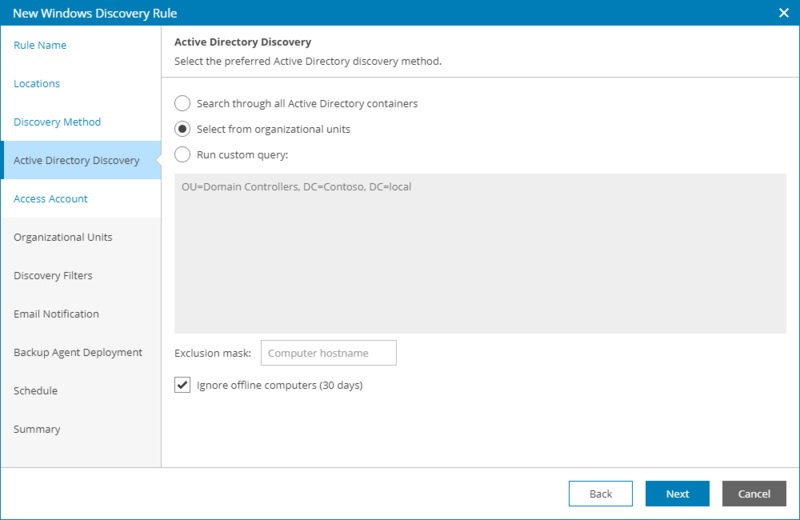 Active Directory discovery rules target AD containers, which helps perform dynamic discovery: if new computers join a domain, a new run of an AD-based rule will discover these computers. Deploy a master agent on a machine in the company infrastructure. The machine must be included in a domain within which computers will be discovered. At the Discovery Method step of the wizard, select Microsoft Active Directory discovery. 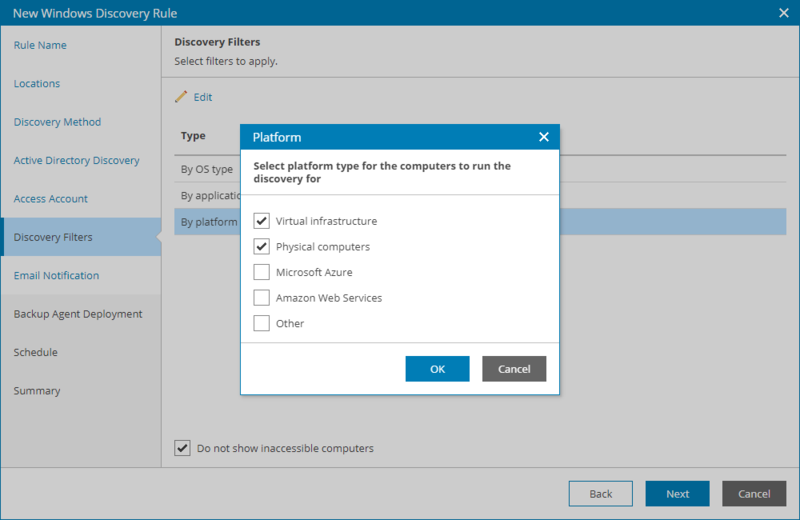 Select Search through all Active Directory containers to discover all computers that are included in the Domain Controllers and Computers organizational units. 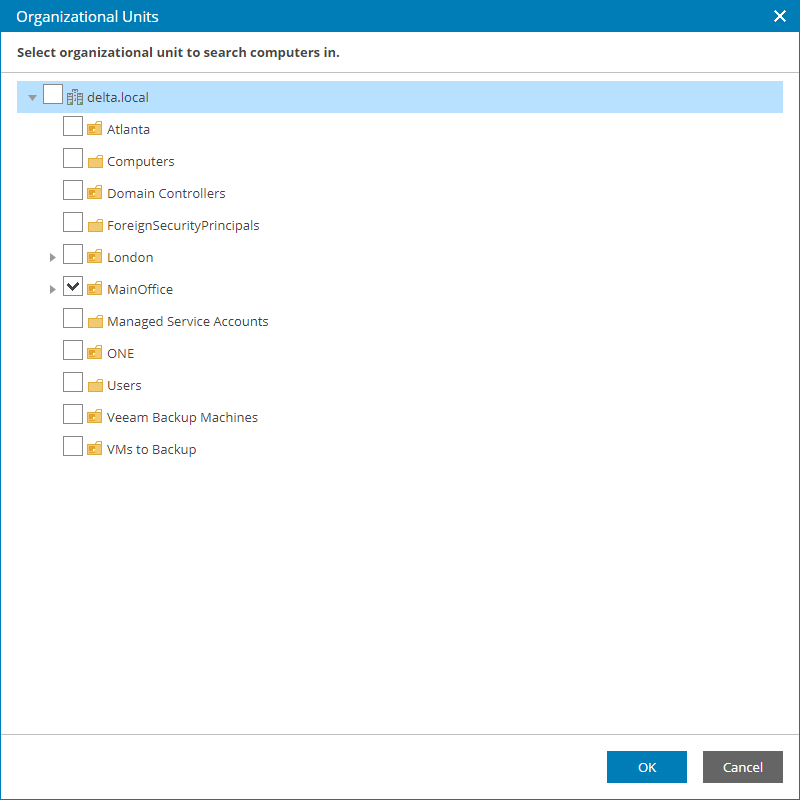 Select Select from organizational units to discover computers that are included in selected organizational units only. If this option is selected, the Organizational Units step will become available in the wizard. Select Run custom query to discover computers based on results of a custom query. In the text field at the bottom, specify a LDAP query that must return a list of computers to scan. In the Exclusion mask field, specify a mask for names of computers that must be excluded from discovery. The mask can contain an asterisk (*) that stands for zero or more characters. You can specify multiple masks separated with commas. Select the Ignore offline computers check box to exclude from discovery computers that did not contact a domain controlled for 30 days or longer. At the Organizational Units step of the wizard, select organizational units that must be scanned for discovered computers. This step of the wizard is available if at the Active Directory Discovery step you have selected the Select from organizational units option. Click a link in the Locations column for the necessary company. In the Locations window, click an organizational unit link for the necessary company location. In the Organizational Units window, select check boxes next to units that must be included to the discovery scope. In the Organizational Units window, click OK. In the Locations window, click OK.